Readers of emotional dramas that are willing to explore the lies that families tell each other for protection and comfort will enjoy White Picket Fences. The novel is ideal for those who appreciate exploring questions like: what type of honesty do children need from their parents, or how can one move beyond a past that isn’t acknowledged or understood? Is there hope and forgiveness for the tragedies of our past and a way to abundant grace? When her black sheep brother disappears, Amanda Janvier eagerly takes in her sixteen year-old niece. Tally is practically an orphan: motherless, and living with a father who raises Tally wherever he lands– in a Buick, a pizza joint, a horse farm–and regularly takes off on wild schemes. Amanda envisions that she and her family can offer the girl stability and a shot at a “normal” life, even though their own storybook lives are about to crumble. What led you to write White Picket Fences? Several years ago I was a court-appointed advocate for children involved in protective services. There were times when I saw that despite the outward appearance of a less-than-perfect home, a child could be loved there. Just because a parent is unconventional or unsuccessful career-wise or makes choices that buck societal norms, it doesn’t mean that he or she is by default a “bad” parent. Likewise, parents who we would traditionally call “good” -meaning they provide, they protect, they don’t hit, they don’t ridicule – can nevertheless make decisions regarding their children that have hugely negative effects and yet their outward appearance would never lead anyone to suspect it. Even if you live behind a white picket fence, you still have to deal with the fallout of a living in a broken world. You can’t hide from it. The perfect, idyllic life is an illusion. Life is a weave of both delight and disappointment and it’s precisely these things that give it definition and depth. To ignore what is ugly is to cheapen what is beautiful. You dovetailed a current day family drama with the Holocaust and the Warsaw Ghetto. Why the connection? I think it’s fair to say that the depth of the atrocities inflicted during the Holocaust wasn’t fully appreciated until after the war. There was ugliness happening, if you will, and much of the West failed to see it — for whatever reason. Within the horror, though, people made brave choices, selfless choices. And there were survivors who had to choose what they would take with them from the ashes of their suffering. I wanted to explore how a person makes that decision. Even the decision to pretend it never happened is a decision regarding those ashes. What do you think interests you about the intersection of personal relationships and perceptions – a theme you wove into both The Shape of Mercy and White Picket Fences? I see every great work of fiction being about human relationships. Gone With the Wind is so much more than just an epic story with the Civil War as a backdrop. It’s a story of human relationships. Scarlett and Ashley, Scarlett and Rhett, Scarlett and Melanie, Scarlett and her father. It’s within our closest relationships that our brightest virtues and worst flaws are exposed. That’s why there is such tremendous story value within intimate human relationships. We are at our best and our worst when we are responding and reacting to the people who shape who we are. Human history is the story of relationships and what they teach us about what we value. And what we don’t. 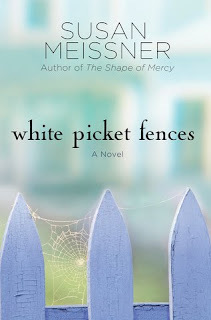 White Picket Fences is a different kind of novel than your acclaimed book, The Shape of Mercy, but there are some similarities too. Can you explain those? As with The Shape of Mercy, there is a historical thread in White Picket Fences, though it is not as dominant. The invasion of Poland by the Nazis is woven into the story, and provides the backdrop for Chase’s and Tally’s discoveries about hope, dreams, and redemption. This thread is enhanced by visits to a nursing home where Chase and Tally meet a man blind from birth who survived the occupation of Poland. It is also a story that draws its pathos from family dynamics and the near-universal desire we have to make straight what is crooked. There are two young protagonists in White Picket Fences, like there was in The Shape of Mercy, as well as a third character, who, along with the two men in the nursing home, provide a similar multi-generational story thread. What do you hope readers come away with after reading White Picket Fences? The pivotal moment in the story for me is when Josef says to Chase: “[This] is what all survivors must decide. We have to decide how much we will choose to remember, how much courage we are willing to expend to do so.” It takes courage to acknowledge and remember what drove you to your knees or nearly killed you. If you choose to forget – and that’s assuming you actually can – then it seems to me you suffered for nothing. You are different but you don’t spend any time contemplating – or celebrating – how. I’d be happy if there was a takeaway for someone out there who needs to consider that. Susan Meissner is the multi-published author of The Shape of Mercy, named one of the Best Books in 2008 by Publishers Weekly the ECPA’s Fiction Book of the Year. She is also a speaker and writing workshop leader with a background in community journalism. A devotee of purposeful pre-writing, Susan encourages workshop audiences to maximize writing time by mapping the writing journey and beginning from a place of intimate knowledge. She is the leader/moderator of a local writer’s group, a pastor’s wife and the mother of four young adults. A native San Diegan, Susan attended Point Loma Nazarene University. 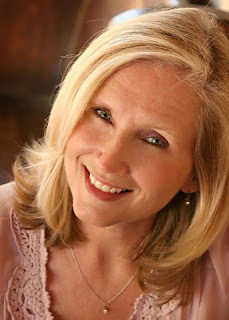 When she’s not writing, Susan directs the Small Groups and Connection Ministries program at The Church at Rancho Bernardo. Enjoyed this interview with Susan and hearing about her insights into human relationships. So true they are. Thank you, Lyn. I think this would be a fantastic read. I have always dreamed of having a house with a white picket fense, I guess we all do. This sounds great. I just finished reading The Shape of Mercy, it was great, makes you kinda glad you did'nt live during that time. WOW, if someone had something against you you could be called a witch.